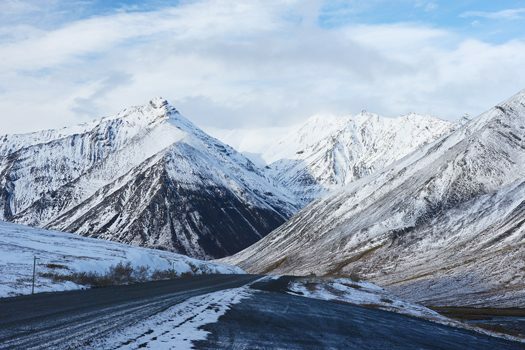 Known as one of America’s loneliest roads, the Dalton Highway is a 414 mile stretch of gravel and dirt that runs through the wintry Alaskan wilderness. Made famous by the show “Ice Road Truckers”, it was built as the service road for the Trans-Alaska oil pipeline and is victim to incredibly testing weather conditions, with temperatures known to have dipped below -76°F. This route also includes the world’s northernmost truck stop in Coldfoot – a town that got its name in the early 20th century when travelers faced by the approaching winter simply gave up and headed home. Even so, the Dalton Highway is surrounded by breathtakingly beautiful scenery, cutting through forest and tundra, crossing the Yukon River and traversing the towering Brooks Range before ending at the Arctic Ocean.